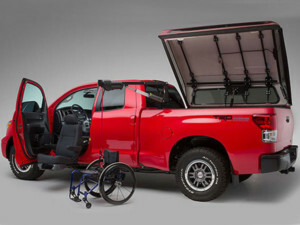 While minivans have a lot to offer for mobility, there are those of you that we salute and say, “There’s somethin bout a truck!” You know who you are, and where you want to go, and that’s why we offer a full line of mobility solutions specifically for trucks. These vehicles can still offer full independence and get the job done at the same time. Your lifestyle is important to us, and there are many products available to make your truck more mobility friendly. We can fully outfit your truck to fulfill your exact needs and expectations. Goldline provides and professionally installs a variety of pickup equipment including transfer seats, wheelchair lifts and power toppers. Along with a Bruno lift, these toppers allow you to load and stow your mobility device effortlessly in the box of your truck securely stored out of the elements. Other options include cab interior lifts, adaptive driving controls and a full line of available truck accessories to improve your ride. Contact our Certified Mobility Consultants today for our recommendations, and to learn more about truck mobility solutions.